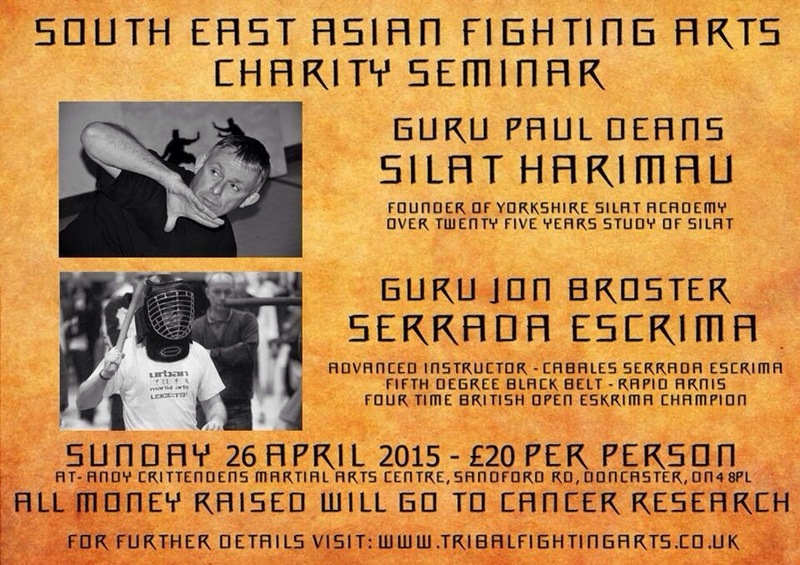 On Sunday 6 April my friend and silat teacher Chas Harvey passed away having been diagnosed with cancer of both the liver and pancreas only 2 weeks previously. Whilst great strides have been made in treating some cancers (such as lung & breast cancer) over the lady few years, survival rates for liver cancer remain shockingly low. In memory of Chas, Paul Deans and I are coming together to hold a seminar to raise money for cancer research; hopefully we can make this an annual event. Paul has over 25 years of experience in silat and has trained in a variety of styles; he is one of a very small group of people to have been promoted to the rank of Guru by Richard de Bordes. I have been training in Filipino martial arts for over 20 years. I hold the rank of advanced instructor in Cabales Serrada Escrima under Mark Wiley and a 5th degree black belt in Rapid Arnis. I am also a 4 time British Open Eskrima champion. This is a great opportunity to train in some of the world’s most effective fighting arts. A massive thank you is also due to Andy Crittenden for giving us the use of his martial arts school for the day.